Paco Díaz (Palma de Mallorca, Spain) on 30 July 2008 in Architecture. An amazing image. Love the shapes, color and excellent detail. You scored again, my friend - a very, very beautiful capture. This is very unique architecture, I am not sure I have ever seen anything so abstract... thanks for sharing! Love the light on this as well Paco! Stunnign shot of this stunning building great work ! Le n&b renforce l'austérité du lieu et la simplicité des formes ! Bien joué ! i love the abstract shapes of this amazing building and how the interplay of light in the air reflects off of all of its surfaces... simply a joy to see from all angles! It is what exactly ? 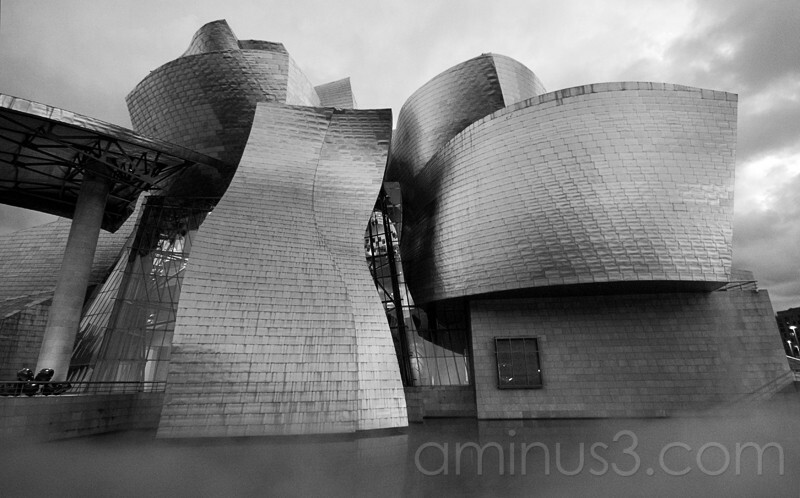 @missparis: This is the building of the Guggenheim Museum in Bilbao, a work of the architect Franck Gehry. Thanks for visiting muy blog. I like this shot more than yesterday, but wonder what the architect had in mind when designing this building, or did he just let his mind run free and this was the result..? the B&W works well to illustrate the texture and design of the building - I wish more architects were making new designs - I am getting tired of the same old rectangle buildings all over the world! I think computer aided design is allowing people to experiment much more than they ever could before. I also like this more than yesterday's... amazing forms and patterns!!! Beautiful capture! Now paco you give me a problem! I don't know which of your pictures of the Guggenheim Museum is my favorite! hehe... I love your photos! Keep 'em coming! Amazing architecture. I really want to go there someday. I went to the Guggenheim in New York City, NY. it was fantastic, but nothing in comparison with this! No tengo ni idea de cómo y dónde se vota ¿me lo cuentas? Acabo de enviarte un correo desde mi otra dirección, con un fondo de carta hecho por mi.